The future is here with this 43 Leopard by Nova Luxe producing a "0" Carbon Footprint with her electric Solar Powered motors and Unlimited Range. Let Global One Yacht Sales assist you in stepping into the next generation of Solar Powered Luxury Yachts. We are a worldwide dealer for the Nova Luxe Line. There were no details left unattended in the creation of the new Leopard 43 Powercat, including the hull design, the updated interior, and much more. Built by Robertson & Caine with exterior design by Simonis Voogd Design, the Leopard 43 Powercat replaces the Leopard 39 Powercat. The Leopard 43 PC is a completely redesigned mid-sized catamaran built with the quality foundation that has come to be expected of Leopard Catamarans. The stepped hull design adds interior volume above the waterline, allowing for roomier accommodations in the hulls without sacrificing the performance of the yacht. 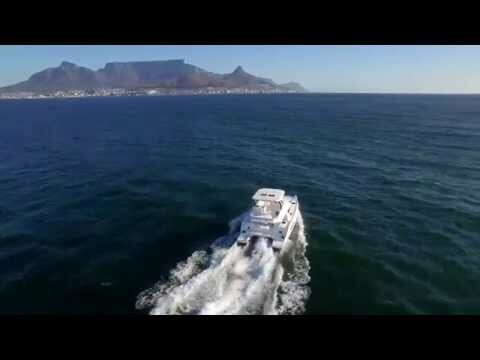 With narrower hulls and less wetted surface below the waterline, the Leopard 43 Solar Power by Nova Luxe reaches an impressive maximum speed of 13 knots and maintains exceptional fuel efficiency when running on the diesel powered generator.